A hilarious story of mothly endeavour that celebrates the spirit of adventure. By The Bear Who Stared creator, Duncan Beedie. Molly the moth lives in the back of an old wardrobe. She loves her home and her family but she yearns for adventure. So by day she helps her mother look after the larvae, and by night she prepares for her space mission to the MOON! 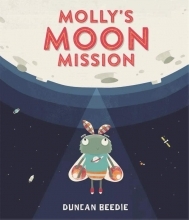 It`s no easy feat for a little moth to fly all the way to the moon - but Molly is not a moth to give up on her dreams.